Well … I got over myself and put on a bunch of (unnecessary) clothes and walked/jogged around my neighborhood with Jon and the dog last night. Turns out it’s a lot harder to dwell on the fact that a dog might kill me when my hips feel like they might snap off. I did day 1 – AGAIN, for the millionth time – of the C25K plan. So … I jogged for 60 seconds, walked for 90 seconds, repeat. It was actually very easy considering I felt like I was risking my life, it was dark, about 30 degrees, my neighborhood has sidewalks that are uneven, broken in places, with trees and bushes (rudely) covering sections, AND considering I had to walk/jog right down a row of restaurants that smelled like doughnuts. Physically – it was fine (minus the hip thing, but it was pretty marginal). I have been very careful re: my foot since I injured it, but it’s been better lately. I iced it last night before bed, just in case, but it really felt fine – and still feels fine this morning. Honestly, I’m a little surprised. Even just the tiny bit of jogging I did last night would’ve meant a day of almost immobility 6 months ago. I’m very tempted to repeat last night again tonight (vs. every other day) or to skip ahead to week 2 or 3 since it was so easy – but I know I need to take the whole thing slowly so I don’t wind up in pain again. Jon is doing the C25K thing with me – and dragging the dog along – because he is sweet, but he runs about 10 miles when he’s alone. I really want to be able to run with him – to keep up. I am SO sick of being restricted to a GD gym. This will be a good thing if I can keep it up. It completely wore the dog out. 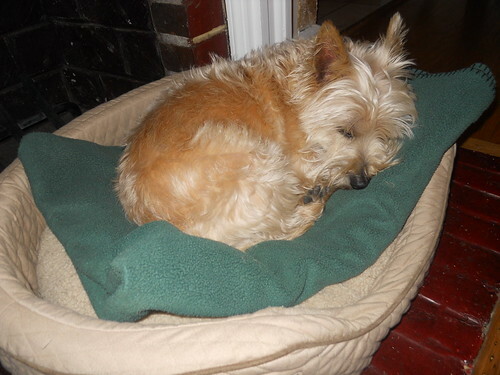 He crawled into his bed as soon as we got home and stayed there until it was time to go to our bed for the night. Good thing, too – he drove me CRAZY all day yesterday with his hyperactivity. I was invited to go to a gym (as a guest) with a friend yesterday, too, so I took advantage of it. We did a pilates class, which I very much needed. It was different than my typical pilates class in that it was sort of dark and soft music was playing and there was a lot of stretching and relaxing. My regular class (taught by my trainer outside of a gym) = louder, fast music and intense, fast sets of things that seem designed to kill me. I leave my regular pilates class sweating and feeling worn out – I left yesterday’s class feeling relaxed and stretched. 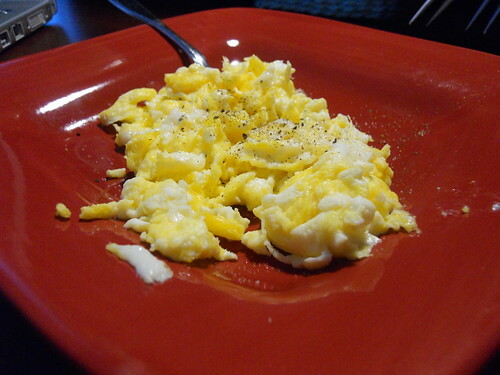 Different, but really, really good – and what I needed after several days of inactivity. 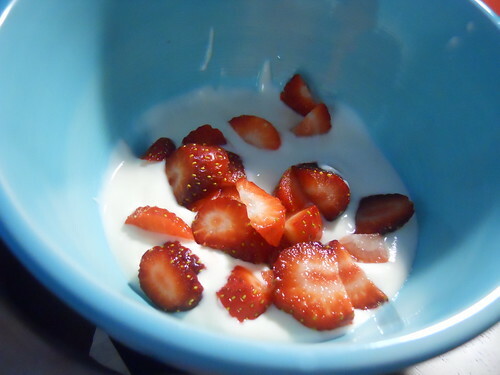 Breakfast was (scrambled in butter) eggs and a little bit of yogurt + strawberries. 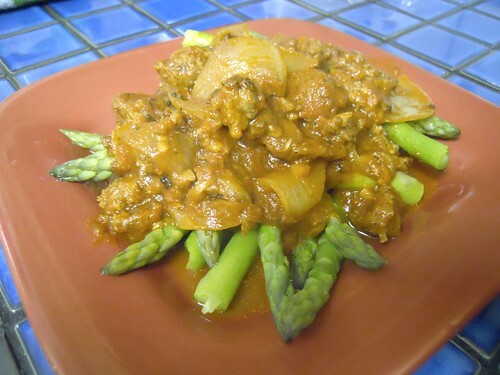 Dinner was red sauce w/hot italian sauage and an onion – over asparagus. Today? I’m planning to do one of my trainer’s pilates dvd’s and am also planning to (really fast) walk the route we took last night. I’m still sitting in my pajamas at 11:30am, but it will happen eventually.